Create an elegant bedroom dressing table with these illustrated instructions. 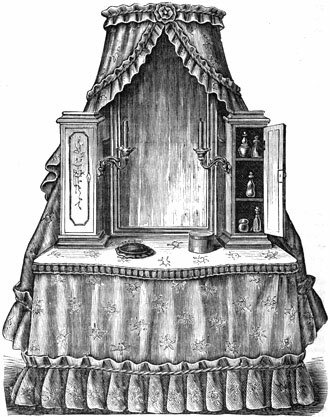 During the 19th and early 20th centuries a dressing table, or toilet-table, was one of those tasteful additions to a lady’s bed chamber and, perhaps, the most feminine of any other piece of furniture in the bed chamber. 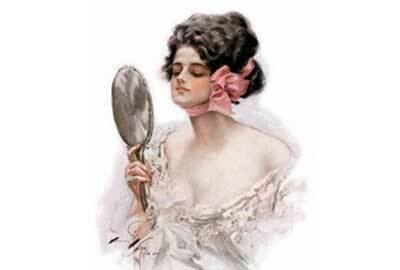 The eminently gracious lady would show her refinement in the arrangement and furnishing of her bedroom dressing table. Picture a dressing table with rich lace hangings interlined with rose silk, a combination which would impart an exquisite glow to the complexion, and a mirror so perfect that it reflected each image as clearly as though it were a sparkling diamond. This toilet-table belonged to the true lady of the world, decorated with all its costly accessories. Re-create an elegant and luxurious dressing table with these instructions. Any table can be converted into a dressing table by adding a board to form the back and top. Next, cover the board at the back and the top of the table with a heavy fabric to match the bedroom decor, and arrange skirt drapery below in large pleats or gathers. Add an edge of lace, ribbon or braid round the table. Arrange side curtains to correspond with the rest of the decorations, looping them back with large rosettes of satin ribbon. With this elegant bedroom dressing table on the right, the most conspicuous and prominent feature is the richly carved dressing-glass or mirror flanked by two gilded cherubs on scrolls with the candelabras. If possible, the dressing table would be made to fit between two windows, as this afforded the best light for dressing during the day. 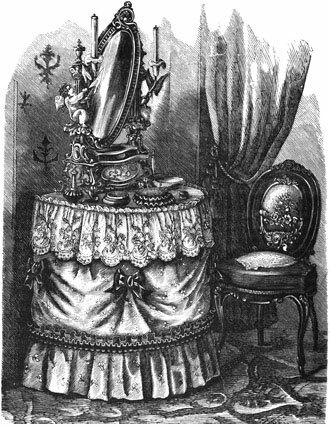 A bedroom dressing table was never placed so that the light was cast upon the mirror, but upon the person performing the toilet in front of it. The table is a semi-circular design with a pine top supported on four strong legs. The top is first covered with a piece of heavy cloth, such as a section of an old blanket or table-cover, over which is stretched a cover of dimity, embroidered with white or colored braid, in a design adapted to the size and form of the table. Around the lower part of the table, and covering the legs, is a drapery of linen or other material, headed by a Swiss ruffle with an embroidered edge. A narrow ruffle edges the top, and at the bottom of the colored drapery is a plaited ruffle, half a yard deep. The upper edge of the ruffle is folded down and a ruching, made in a contrasting stripe color, is placed one inch below, thus making a beautiful heading to the lower ruffle. Bows of ribbon catch up the cover in four places and complete the bedroom dressing table. The bedroom dressing table shown to the left is about four feet in width with two long narrow cabinets placed on each side. Attached to the cabinets are two candle brackets. These cabinets are screwed or nailed very securely on the top of the table to support the plain, but neatly framed mirror. Over the top of the glass is fastened a frame around which is draped a hanging made of Swiss lined with a rose colored lining. First, a width reaching from the top to within a few inches of the floor, is fastened to the upper back-ends of the semicircular tester, the ends finished with a deep ruffle of the same, then on the tester above this is arranged two pieces, made by tacking a width of the Swiss and lining two yards long, folding it diagonally from corner to corner, cutting and trimming the two cut edges with ruffles of the same, and arranging them as shown in the illustration. Around the top tack another ruffle made with an edge above the cord, which runs along the center of all the ruffles. 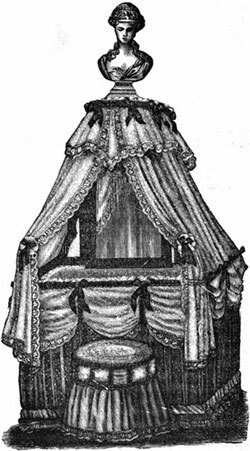 The table-top is covered with a piece of the Swiss over a lining similar to the curtains, and a drapery arranged around the front, made with rings at the top, which slide on a wire beneath the narrow ruffle finishing the edge. This allows access to the shelves within the bedroom dressing table. The beautiful bedroom dressing table on the right may be adapted to the size of the room, and can be draped to suit the color theme of the room. The frame-work and mirror are covered with scarlet or other colored velveteen. The entire table is next covered with crimson glazed muslin, over which is stretched (in gathered folds) dotted lace or Swiss muslin, edged with lace, and a full puff of the thin material. Drapery of the same, with a lined and full-gathered lambrequin, cut with long points in front and edged with the lace, finishes the tester at the top. Around the table a long, straight piece of the Swiss is taken up in graceful loops, held by ruched bands and bows, made of ribbon of the lining pinked out on each edge, the same ornamenting the top. The upper part of the dressing stool is stuffed and covered with an embroidered cushion, from which hangs a curtain made of the Swiss and lining like the table with a strip puffed around the edge with ruchings. A favorite piece of furniture for owners of a Victorian house. Furniture once owned by 1920s jazz age diva Joséphine Baker. Explore the evolution of the modern dressing table.